The hills of Western Massachusetts don’t enjoy the year-round warmth of the Florida Keys or Baja California — but Eva and Fred Fierst aren’t inclined to let the weather get in the way of their vision. Visiting friends in balmy locales, they enjoyed the easy indoor-outdoor lifestyle. They returned north to create a modern New England version of the relaxed and open-hearted homes they’d admired, beginning construction in 2013. Perched on a hillside on the outskirts of Northampton, their 3,000-square-foot house maintains a seamless year-round connection with its surroundings — especially in summer, when green vistas fill the wide windows and the thoughtfully designed exterior spaces come into play. The summer dining room, a soaring screened porch, is the first feature that appears after cresting the long, wooded driveway and entering the sunny clearing.Architect Mary Yun, who collaborated on the project with then-partner Lynn Rice (Yun now heads her own firm), envisioned the 300-square-foot porch as a kind of treehouse. 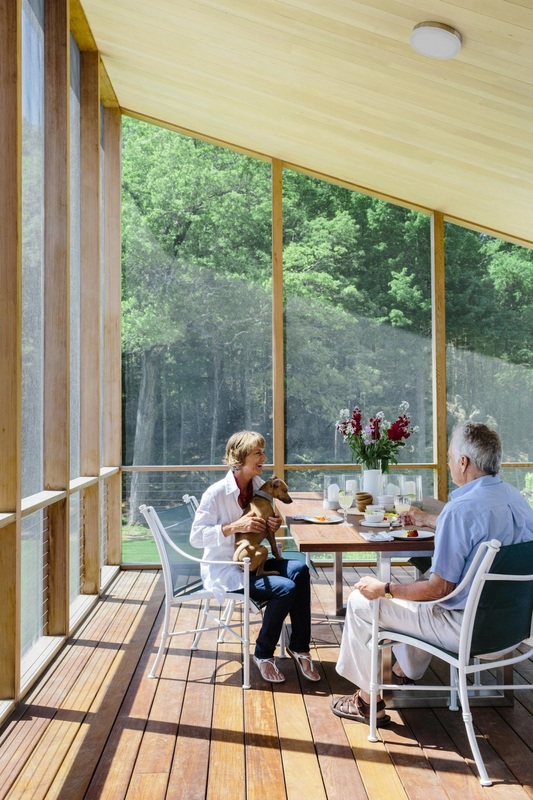 “Most screen porches are too low and don’t actually allow for much ventilation,” she says. “Instead, the built form of the porch should make you feel like you’re outside.” That’s certainly the case with this airy structure, 13½ feet at its highest point and screened from floor to ceiling on three sides. The porch opens to the kitchen and to a slender balcony that extends around the window-wrapped, open-plan living-dining area. These lofty vantage points — porch, balcony, and central living space — overlook ground-level patios outfitted with cushy furnishings. Wall hooks hold folding chairs ready to be toted to a nearby fire pit, built from local Goshen stone. The terraced gardens showcase native species such as mountain laurel and tall grasses. On a lower hillside that Eva calls her “controlled wilderness,” lupines, sweet william, and black-eyed Susans mostly tend to themselves. At the heart of it all is the expansive green swath known as “Fred’s Lawn.” “You should always have a place where you can toss the football,” he says. Maintaining it is a Roomba-like self-driving electric lawn mower from Husqvarna — “the first robotic lawn mower in Hampshire County,” Fred says with pride. As befits a home so attuned to the outdoors, the entire structure was engineered with sustainability in mind. It generates its own electricity from rooftop photovoltaic panels. “We put an extraordinary amount of thought into where the house would be, how to maximize both the views and the solar gain,” says Eva. Deep overhanging eaves help keep the interiors cool in summer; an air-conditioning system is used only to keep humidity in check on the warmest days. Geothermal heating wards off winter’s chill, as do triple-glazed windows and doors imported from Eva’s native Germany. Climate and sun control are especially important, given the couple’s carefully curated modern furnishings and color-soaked collection of South American art. NORTHAMPTON -- In less than 18 months, the building at 9-1/2 Market Street has transformed from a beloved, crowded antique center into a trendy, well-lit coworking community. Flanked by boutiques and just around the corner from Main Street, Click Workspace is now three times larger -- and more visible -- than its former location at 20 Hampton Ave. The enterprise officially opened its new digs on April 1. Click acts as a home-base for entrepreneurs, techies and creative professionals; most of its 38 members live in Northampton, according to Click director Erika Zekos. The new headquarters features meeting, working and relaxing spaces. Members can also opt to pay more for private or shared offices. Zekos said Click has welcomed 12 new members since moving to Market Street. Memberships cost anywhere from $195 to $395 a month. The building is still under construction. But in the coming months, members will also be able to use part of the basement as well as a media room, which will be acoustically isolated for recording audio and video. Jordana Starr, who works for tech startup PixelEdge, has been a member of Click since its founding in 2011. She said she's a fan of the new building. "It's spacious, it's bright. It has a very good flow," she said as she sat at her desk in the second floor's open area. Starr said that around 5 p.m., she'll often hear the soft sound of music rising from the first floor; one of the current building investors gifted a grand piano to Click, Zekos explained. "We have some talented musicians who work here," Starr said, laughing. Zekos said the piano will also be used for community events. Click will participate in Arts Night Out, Northampton's monthly gallery walk. Local artwork is prominently displayed throughout 9-1/2 Market Street, but Zekos said she hopes to bring in area musicians, too. And Click's meetings rooms will be rented out to community organizations, Zekos added. Click replaces the Antique Center of Northampton, which closed in December of 2015 after 28 years of business. The store housed booths for more than 20 antique dealers. The 1930s-era brick building sits around the corner from both the bike trails and Union Station, where Amtrak's Vermonter passenger line began service right around the time Click bought it. Echoes of the antique center remain in the building. Click kept some of the original timber ceiling beams and its wood floors, a contrast to the otherwise modern elements of the space. Coworking enterprises have become an increasingly popular concept, with an aim to boost innovation and collaboration in urban areas. Hadley has its own coworking spaces, Cultivate and Nest. There's also Co.Lab in the Eastworks building in Easthampton, among others in Western Massachusetts. Click will host an open house on Friday from 5 p.m. to 8 p.m. Potential new members will be able to tour the space, listen to live music from the O-Tones and enjoy refreshments, Zekos said. The phrase “rugged individual” isn’t just American lore. It describes a reality of the new economy. Consider the story of Click Workspace, an unusual Northampton nonprofit. Because of tight space at its Hampton Court home, the outfit has turned away people who want what it offers: shared work quarters sized right for entrepreneurial upstarts and other self-employed strivers. Budding entrepreneurs need a place to set up a desk or two and share access to the Internet, meeting space and a copy machine. After that, little stands in the way of creative businesses trafficking in design, digital gaming, consulting services, marketing and web content of almost any kind. Market 9.5 LLC, a company that includes Click Workspace founders Ali Usman and Lisa Papademetriou, last week bought a Market Street building. It will speed renovations so that later this year it can accommodate the next wave of self-starters and grow from 30 members to over 90. This new use of an old building says a lot about shifts in the local and global economies. Companies are increasingly stingy with full-time jobs. And while the number of self-employed Americans is down 5 percent since 2009, one category — computer occupations — has grown 67 percent since 2006, according to Census data. These are people who, rather than signing up with one boss, sell their talents a la carte. When they tire of working at home or at a cafe, some opt for the “co-working” movement Click Workspace represents. A 2011 survey by the website Deskmag took a snapshot of co-working and found that half of 661 participants in 24 countries sharing office space were freelancers, while a fifth were small companies. Most were in the 20s or 30s; two-thirds were male. Click Workspace’s managers are frank about what’s being borrowed. Their project is modeled on shared work areas in San Francisco, Boston and New York providing what some termed the “unoffice.” Usman, a co-founder, helped develop a similar property in Colorado. Other examples lie closer to home. For years, a shared business location has gathered Franklin County entrepreneurs, writers and health-care practitioners into space above McCusker’s Market in Shelburne Falls. But with this move, Click Workspace makes a bigger statement about the collective importance of the businesses it will attract. One by one, the mini-firms under its roof will help build out the base of the region’s digital economy. In the past, Click Workspace hasn’t been able to accommodate small companies as they add employees. It hopes to now, says Mary Yun, an architect who serves as its president and manages Market 9.5. As it scales up, this venture offers a place for business ideas to incubate and grow. Beyond tending to its members’ needs, Click Workspace’s proponents say they’ll reach out by hosting events and offering workshops, proudly flying the flag for the creative computing economy. This little address could be bound for big things. NORTHAMPTON — A prominent Market Street building that for years housed two antique shops could soon be home to as many as 95 to 100 entrepreneurs, freelancers and other business owners under the banner of a co-working enterprise called Click Workspace Inc. The key players of Click Workspace, which opened nearly four years ago in Hampton Court off Pleasant Street, closed this week on a deal to buy the three-floor, 9,000-square-foot building at 9.5 Market St. The building was acquired for just under $800,000 by Market9.5 LLC, a company that includes Click Workspace founders Ali Usman and Lisa Papademetriou, its President Mary Yun, and others. Yun, an architect at Rice Yun Architects in Northampton, said Click Workspace will become the anchor tenant in the building and will occupy the first two floors and part of the lower level after it undergoes an extensive renovation this spring and summer. The new digs will give the co-housing endeavor room to triple the number of members from 30 to over 90, Yun said. Co-working is a growing movement to create community spaces for the self-employed, developers, writers, entrepreneurs and other freelancers who want to work on their own but still have a regular gathering spot where they can mingle and swap ideas. In addition to sharing ideas, members also share amenities such as wifi, conference rooms, kitchen and lounge areas, and other perks. The concept has been popular in urban areas for years — Click Workspace is modeled on similar spaces in Boston and New York — and Yun said Click Workspace wants its Northampton headquarters to be the hub of a similar movement in the Valley. She said the new Market Street building will help in this regard because it will be renovated in such a way that businesses can share resources and amenities through Click Workspace. Market9.5 will lease the top floor of the building to two office tenants which will gain membership to Click. Yun declines to name those businesses until leases are finalized. Usman said Click Workspace plans to expand quickly, with more open seating and offices available. He said Click will finally have room for startup businesses of between two and five people that need office space but don’t want to sign a long-term lease or invest in infrastructure. Additionally, as companies grow, they won’t be forced to move out because of space limitations, Usman said. Usman said he’s also excited about Yun’s vision to expand Click’s hosting of events and workshops, not only for its own members but for businesses, nonprofits and others in the community. Like Click’s current home, the new building will have a large multi-use space that serves as a main office area for members but can be configured for board meetings, fundraisers, book readings and more. Yun said Click also plans on being an active participant in Arts Night Out and host other events featuring the arts. The 1930s building will be renovated by Pioneer Contractors so that it is handicapped accessible and meets building codes. It will include construction of an elevator, a shower and may have a dedicated parking space for a bicycle rack. Yun expects the building to be complete and occupied in the fall. Yun said the group has been looking to buy a building downtown for some time and its leaders are excited to find the perfect fit on Market Street, which they see as key to the city’s future development. With Amtrak service, a bike trail around the corner, and proximity to municipal parking lots, the location couldn’t better, she said. The Market Street building is now vacant, but until last fall housed the Antiques Center for 27 years on the main floor and two upstairs businesses, Stuart F. Solomon Antiques and Metropolitan Used and Rare Books. The Antiques Center closed last month and the other two businesses moved to other locations. Solomon co-owned the building with Stephen Whitlock, who ran Antiques Center. Chad Cain can be reached at ccain@gazettenet.com.